With the nail art trend making waves, people are examining more than just your fashion and hairstyle; they are looking at your nails, too. Truly it should be of no surprise, for we constantly gesture with our hands, bringing them into view. And now with the endless possibility of embellishments—from glitter, rhinestones, crystals and charms—nails are speaking for themselves. This has women rethinking the health of their nails, because in order to achieve certain looks, they must be long, strong and healthy. But with all of the abuse our nails go through on a daily basis—from typing and using them as tools to open or dislodge things to biting them and knocking them against items—reaching this goal can be painstaking, yet not impossible. This tip is a no-brainer. You can’t grow long nails if you bite them and wear them down. Besides, ripping at the nails, no matter how infrequent, causes them to become weak. Picking at chipped polish pulls away/off the fine top layers of the nails, which weakens them and makes them more prone to breaks and tears. Think back to the last time you did this, what did you see? Chances are you noticed white streaks where the chipped paint once was. This is a sign you’ve pulled away particles of your nail. 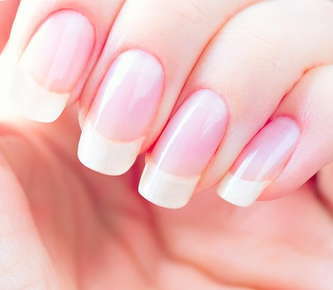 Without your nails fully intact, they are susceptible to breakage and damage. Some forgo applying a base and top coat to their nails for a variety of reasons, including lack of time and not wanting their actual nail to become stained. With proper application, however, you will avoid these problems. More importantly, having these coats creates a stronger foundation and makes your polish last longer than if one was applied alone. We’ve all done it: We want to open up a can of soda or scrape something off of a surface, and so we use a practical, readily available tool like our nails. It gets the job done (at least most of the time), but at the risk of chipping, breaking or weakening our nails. Refrain from using your nails as a means to perform tasks that place pressure on your nails or force them to work beyond their capacity. You’ve heard that you are what you eat. This statement, though cliché, is very much true. A well-balanced diet of fruits, vegetables and proteins will strengthen you from the inside out. You will not only see a difference in the appearance of your skin and hair, but your nails too. Manicurists specialize in nail care, so going regularly will ensure your nails are in good shape. They will soak the nails, clean them thoroughly, remove old, dry cuticles, file them properly, apply essential oils (in some cases), and employ the proper bases and coats of polish to ensure the nails are strong. If this process is continued and performed regularly, the nails will, without a doubt, strengthen over time. Think of it as a workout for your nails. If you go to the gym often, your body becomes conditioned and you replace fat with toned, strong muscle. You also see benefits in your cardiovascular health and stamina. You might think that filing your nails back and forth is suitable, but not so because the friction impairs the nails. Instead, file your nails towards the center. A strong nail is leveled, shaped and smooth; meaning without rough edges that can get caught on fabrics and surfaces that can rip them. Nail polish removers often contain acetone, which is harsh on the nails, causing them to dry and become brittle. Also known as vitamin H, biotin can increase nail thickness and minimize splitting, according to a 1999 study published in the Journal of the American Academy of Dermatology. Cleaning products contain chemicals that can leave your nails weak and brittle. We understand that cleanliness is a normal ritual that we all must engage in, so just be sure to wear gloves while performing household tasks, including washing dishes. If you have weak, brittle nails, tricks and tips can help, but they are no substitute for the care and attention offered by knowledgeable nail salon technicians. Visit our salon and let us help you make your nails resilient.